My friend Brian Stowell and I recently traveled to Chile and Bolivia for what would turn out to be a memorable journey. We spent a few days in San Pedro de Atacama, a small town in the Atacama desert in northeastern Chile. 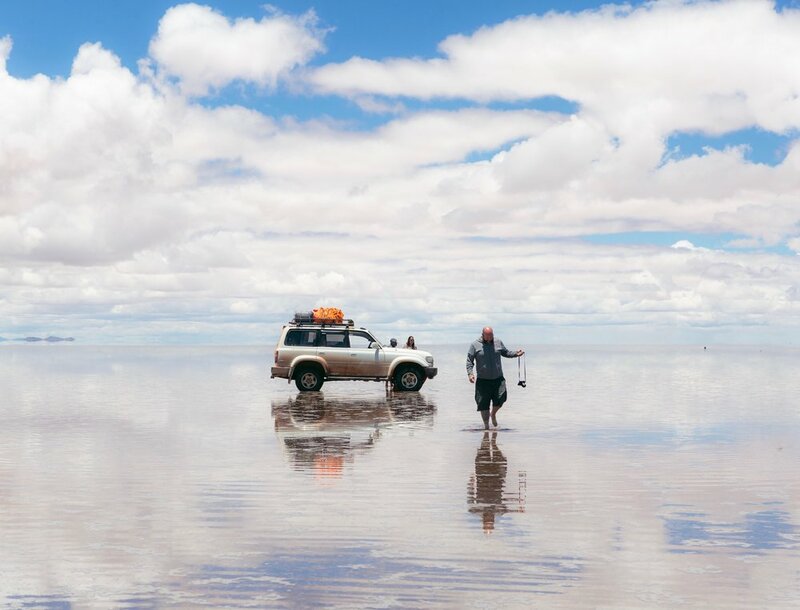 We found a guided tour into Bolivia to see Salar de Uyuni, the world's largest salt flat, little did we know our journey would start out with delays due to weather in the mountains. We crossed thought an immigration checkpoint in San Pedro and headed to the Bolivian border. At the border because we were Americans we needed to provide our passports, 2 passport photos, 2 color copies of our passports, a full itinerary of out trip while in Bolivia, and a proof of a yellow fever vaccination all to get a $160 visa good for 10 years. We had one problem though, Brian didn't get vaccinated, so he just handed the border agent the money for the visa and the issue seemed to resolve itself. Our guided tour was comprised of a larger group, after we cleared customs the group was divided into smaller groups of six. Each group was assigned a Land Cruiser with a driver. Ours was made up of three russians, Brian and I, and a Chilean woman who spoke very little english but was made to translate, I felt bad for her you could see she wasn't comfortable with it at all. The first stop on our trip was the national park office for a $150 Boliviano ($23 USD) permit to be in the park. 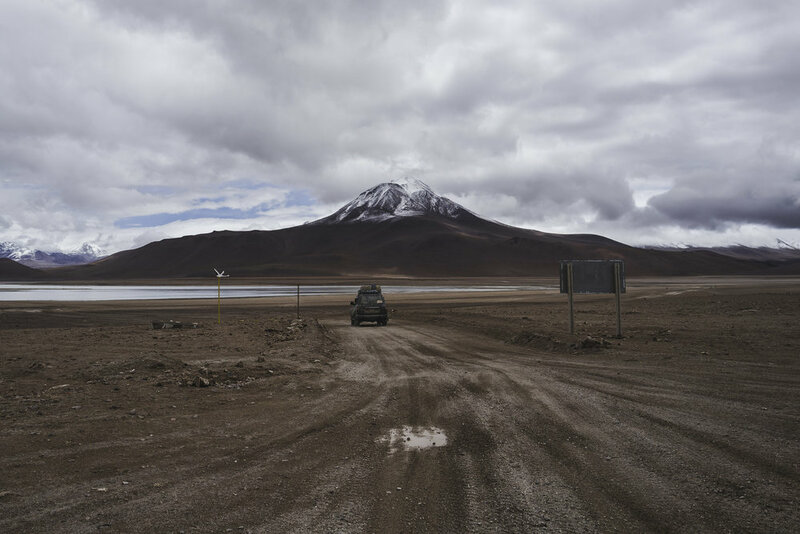 We left the parks office and headed to a pair of semi interesting salt lakes called Laguna Blanca and Laguna Verda in the basin before we made out way up into the mountains. As we climbed it began to rain, Brian seemed disappointed with the weather and eventually stopped getting out of the vehicle. The weather made it hard for any of us to really enjoy the stops. Lucky for the group our driver was looking out for us and decided to save Laguna Colorada for the next day in hopes that the rain would clear up. Laguna Colorada was the stop on the tour the whole group was excited about. The hostel we stayed at was damp concrete building. The dorms had five beds and each tour group had its own little area. The heavy rain woke me up in the middle of the night. As I was waiting to fall back to sleep I noticed the Russian couple had snuggled up into a single bed together, I remember thinking they were a little old to be fooling around in a dorm full of people. in the morning I found out the roof had been leaking on his head so he moved into her bed to avoid being awake and wet all night. In the morning we packed out Land Cruiser and set off for Laguna Colorada, I had anticipated this being the coolest part of the trip. Leading up to the trip I had been pouring over photos of the lake, in ideal conditions the lake glows with a red or pinkish hue and has flocks of flamingos peppering its surface. I was happy our driver waited a day to take us to the lake instead of going there in the rain the previous day. 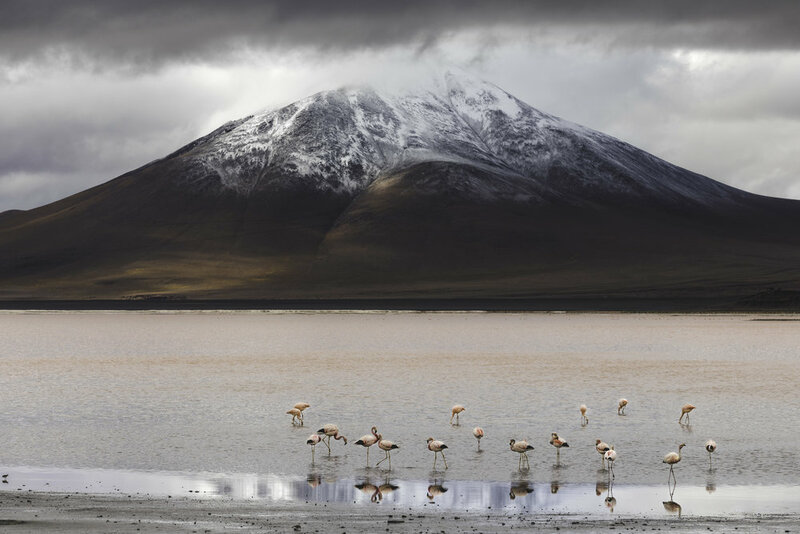 When we arrived that day, the sky was overcast so the color of the water wasps intense as i hoped, but there were flamingos everywhere, and it was an amazing sight, even with the clouds dulling the lakes colors. Our next stop along the tour was Desert Siloil, it's a patch of high desert up in the Andes. Its filled with wind beaten sandstone that look like they are straight out of a Dail Painting. WE had climbed roughly 5000 feet in elevation and i was finally starting to acclimate to the elevation. The day prior I was losing my breath just getting out of the car. The rest of our morning was spent around a few lakes that were underwhelming after our time at Laguna Colorado. We stopped for lunch near a volcano called Tomasamil, we explored the area for a bit but the rain drove everyone inside before lunch was ready. The first part of our afternoon was spent in this intensely beautiful area, the backdrop was towering mountains in the distance, the landscape was covered in unusual rock formations, and Brian perked up as he reminisced about how it reminded him of Moab, Utah. The rest of the afternoon was spent driving to a little town called Julaca. The whole town was made up of a bar, a general store, and run down school that had a few kids playing football in the yard. Our group enjoyed some drinks at the store while Brian and I walked around town, we needed a stretch after being stuffed into the back of the land cruiser all afternoon. We left Julaca on a dirt track that sat just barely higher than the flooded salt flats that surrounded it. We had been warmed that the flats would be flooded, but I was shocked to see that they were under a couple of feet of water. I'm always impressed by how very part of the world surprise me in its own unique way. That night we stayed in a place that was nicer that the damp hostel from the night before. We had 30 minutes of Wifi access after dinner, a hot shoer and I only had to share a room with Brian. A huge storm came through that night. The rain flooded the route we were going to take to the Salar, so we had to take the long was through Julaca and Uyuni. The flooded salt flats outside of Julaca. We got on the road early, stopping for breakfast around 7:30 in a sleepy little town called Rio Grande. All three Land Cruisers parked together in town and the drivers pulled out tables that the promptly covered with bread, jam, nutella, bandana, nuts and yogurt. They heated water for coffee and tea and we had a feast that morning. After Breakfast everyone seemed to grow frustrated in the three hour drive to Uyuni, no one was telling us what was going on and why we weren't headed to the Salar de Uyuni. Eventually we ended up at what can only be described as a train graveyard. These trains were abandoned and covered in graffiti. Looking back i wish i wouldn't have let they lack of communication frustrate me as much as it did because it was a fascinating experience. As we were leaving the train yard we got word that we were headed to Salar de Uyuni, yu could tell everyone was relieved and excited by the news. The salt flats were covered with ankle deep water as far as the eye could see, shallow enough that we could drive out onto them. I jumped out of the Land Cruiser barefoot, the warmth of the water felt great against my skin. The reflection of the water made the world seem huge, the whole experince was incredible. Our group spent an hour goofing off, taking photos and just living in the moment before we headed back to Uyuni for a late lunch. We were never really told what was happening after the salt flats, we were under the impression that we would be staying in Uyuni for the rest of the day when we stopped at the information center, but we were picked up shortly after arriving and began to head back to San Pedro. En Route we took a quick break in a town called San Cristobal which fortuitously had a small Sunday parade on in the center of town. We stayed there long enough to watch a little before we got back on the road. The remainder of our drive was a blur of shot stops to use the restroom and for our drivers to discuss hot to traverse the many flooded areas along our route. We arrived at a small town I could never point out on a map, and slept for a few short hours in a hostel before heading back on the road. 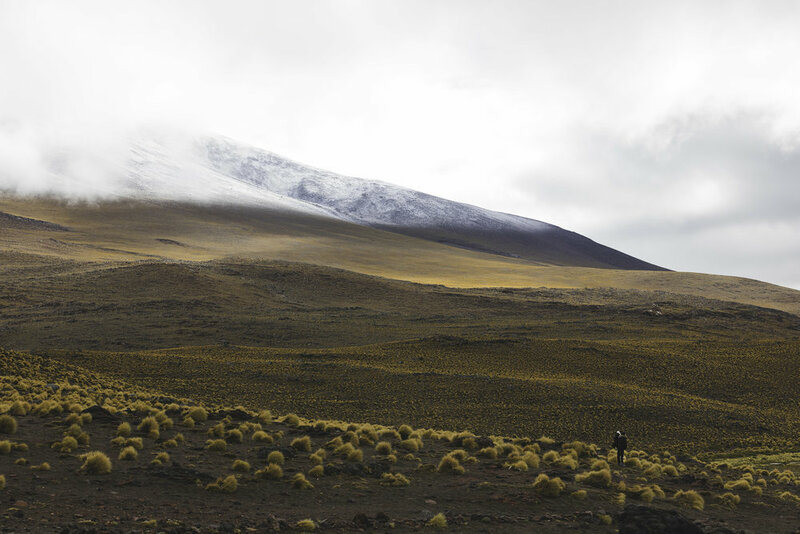 We left before sunrise, opening six hours in a car making our way to the bored of Chile. We had arrived where we had started, with a story to tell and fond memories of a few very long days in Bolivia. High in the Andes during a rain storm on the first day of the trip.